After the holidays, almost everyone starts some sort of new workout routine. 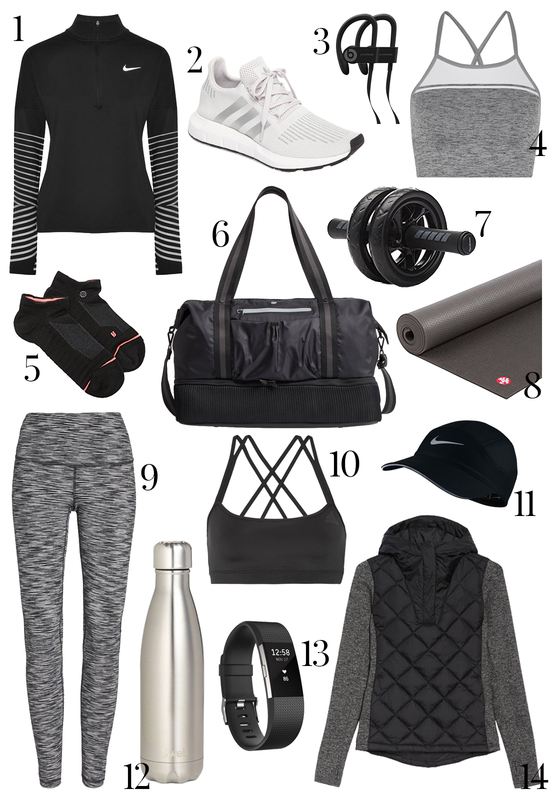 For me I try to stay active most of the year, and having apparel/gear that is functional and fashionable is always a win in my book. And as someone who works from home, there are often days I wear workout clothes as my everyday clothes, even if I didn’t end up making it to the gym. I always love a great pair of fitted leggings and this pair is so cool with the black & white space dye effect. I’m in need of a new pair of workout shoes and I love these, plus they come in 4 other color combinations! Its great to have some workout gear and home, just incase I can’t make it into the gym. This yoga mat & ab roller are great additions and can be used almost anywhere at home. I haven’t invested in these wireless headphones yet, but I’m definitely getting them this year. I have heard so many great reviews about them. I need all these gears to keep me motivated! thanks for the list! I’m definitely going to ask for some of these this Christmas!